Robin and Joshua chose Shephard’s Beach Resort on Clearwater Beach www.shephards.com as the Venue for their destination wedding in early December. Robin looked beautiful as she was escorted across the sand by her father and her son, to join Joshua at the water’s edge. 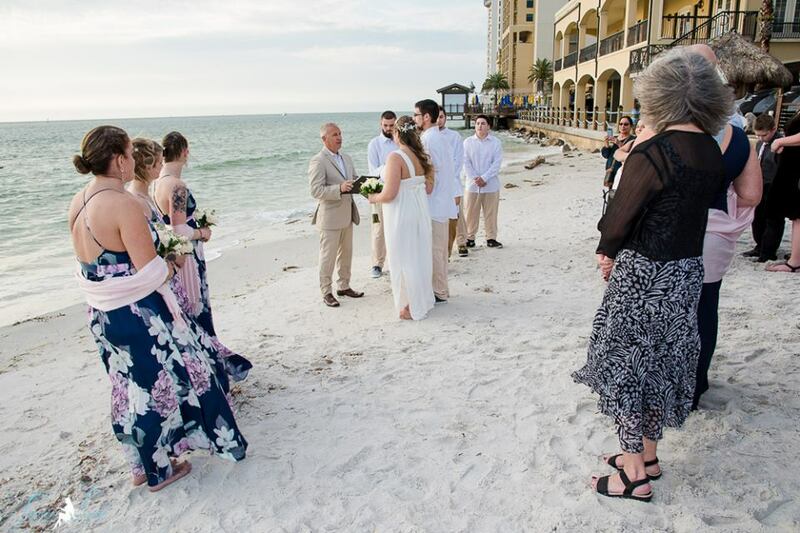 There, with an amazing view of Clearwater Pass and the Gulf of Mexico as their backdrop, and in front of their family and friends, the couple shared their vows, exchanged rings, and were pronounced husband and wife by Rev. Rick Lackore of Sensational Ceremonies www.sensationalceremonies.com . Venue Coordination provided by Leah and the rest of the staff at Shephard’s. Special thanks to A True Love Affair Intimate Florida Weddings https://www.facebook.com/atrueloveaffairweddings , http://www.atruelovewedding.com/for coordinating the ceremony and Wedding Photographer Tammy Lackore with True Love Photography www.atruelovephotography.com for providing this beautiful photo during their ceremony. Congratulations to the new Mr. and Mrs. Joshua LaBranche!